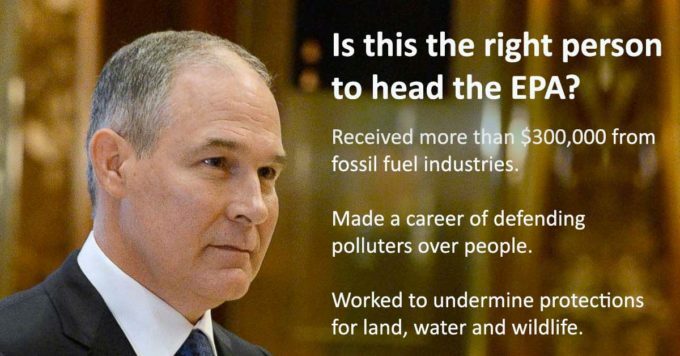 On his last day in office, Scott Pruitt was still working to screw the American people-- for generations to come. According to a report this morning from the NY Times, on Friday, in his final hours in office, the EPA granted "a loophole that will allow a major increase in the manufacturing of a diesel freight truck that produces as much as 55 times the air pollution as trucks that have modern emissions controls." That followed "intense lobbying by a small set of manufacturers that sell glider trucks, which use old engines built before new technologies significantly reduced emissions of particulates and nitrogen oxide that are blamed for asthma, lung cancer and other ailments." Scott Pruitt (and Donald Trump)-- always looking out for more effective ways to destroy life on the planet earth. Susan Collins (R-ME) had the good sense to vote against confirming Pruitt, but, alas, to no avail. Two right-wing fake Democrats, Heidi Heitkamp (ND) and Joe Manchin (WV) voted with the GOP to confirm, as they do so frequently, and Joe Donnelly hid under his bed and refused to come out to vote. So much damage could have been avoided. The case to back grotesquely bad Democrats is always... "the confirmations." 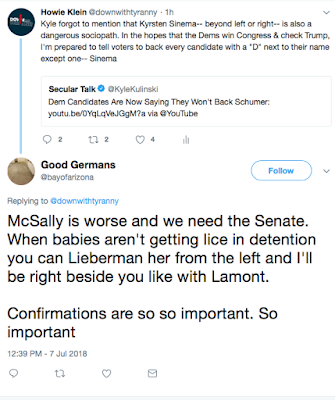 It was Bay of Arizona's argument today on Twitter when I wrote that I could see supporting every horrible, worthless Democrat for the sake of checking Trump, except one-- Kyrsten Sinema. We haven't heard the last of Pruitt yet. All those investigations aren't going away and some of the ethics ones will likely turn into criminal ones. Politico: "Pruitt is still facing more than a dozen federal probes from his tenure as EPA administrator, and EPA’s watchdog and congressional investigators are promising to continue looking into his long list of ethical woes and lavish spending allegations. Those investigations have already prompted Pruitt to turn to an outside attorney for advice and set up a legal defense fund before his resignation." Five House Democrats later asked the Justice Department and FBI to open a criminal investigation into whether Pruitt’s activities were used to enrich himself and his family-- such a probe would not necessarily be disclosed publicly. Remember all those ridiculous media reports-- actual "fake news"-- absurdly claiming that Pruitt had resigned. What kind of stupid is that? All their readers and viewers children who have to be shielded from something as unpleasant as the word "fired?" I was doing a radio interview when the host interrupted with the breaking news and read it as it was coming off the transom, including "resigned." I started laughing. It wasn't until Friday that news sources started acknowledging that Trumplandia realized they couldn't afford to keep him on any longer and that Kelly and other persuaded the Imbecile-in-Chief to let him go. Being an incredible coward-- as most bullies are-- Trump hid upstairs under his bed as Kelly called Pruitt and told him to send in his resignation letter. Bloomberg reported that "Pruitt didn’t want to leave his post and was described as being devastated that he had to resign, said the people, who asked not to be named discussing a personnel matter. Apparently someone told Señor Trumpanzee Pruitt ordering his staff to alter his public schedule to shield some meetings from public view-- now why, oh why, would he do that?-- "could be a criminal violation of the Federal Records Act." Trump doesn't give a hoot about graft and corrupt-- after all, he sets the pace in America's first actual kleptocracy-- as long as no one gets caught. Getting caught as the straw that broke the trumpanzee's back. President Gas announced that "Pruitt chose to resign because he felt he was a distraction." Sure he will! When the "democrats" have too many Heitcamps and Manchins, who needs Republicans to destroy the nation? Made a great argument NOT to vote for Joe Manchin or Heidi Heitkamp.